Breakfast is my favorite meal! In fact, I’d eat breakfast anytime of day if I could. 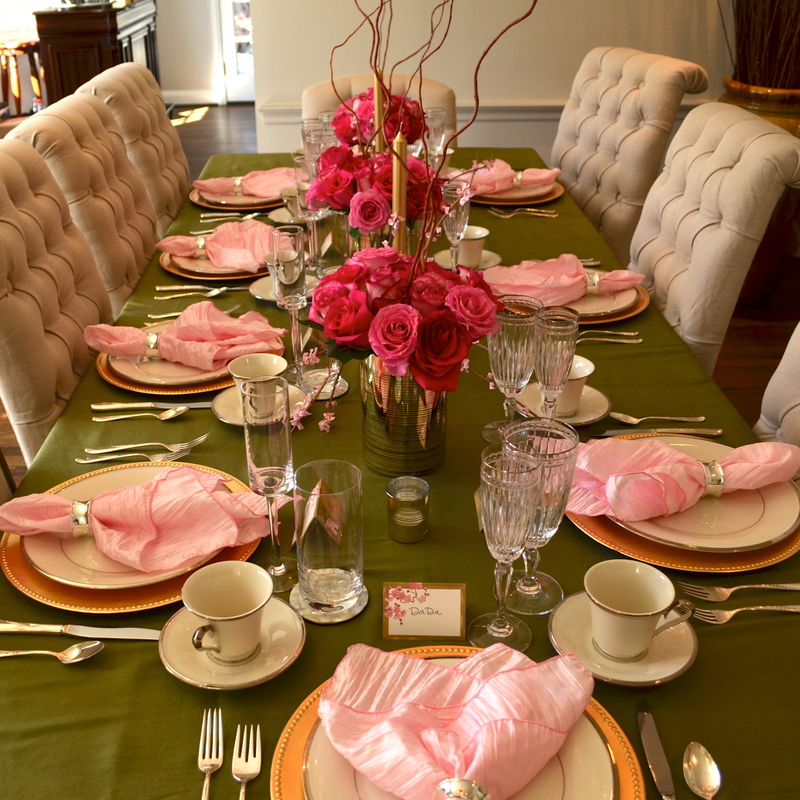 So, when my son asked me to be in charge of planning and preparing a brunch in celebration of the Baptism of my Granddaughter, I jumped at the chance! You may have seen my previous post detailing the day’s activities. I prepared 2 types of Crustless Quiche, a Crema Catalan-French Toast Casserole, a Fruit Salad and Bacon, all served up on a beautiful pink and green tablescape. 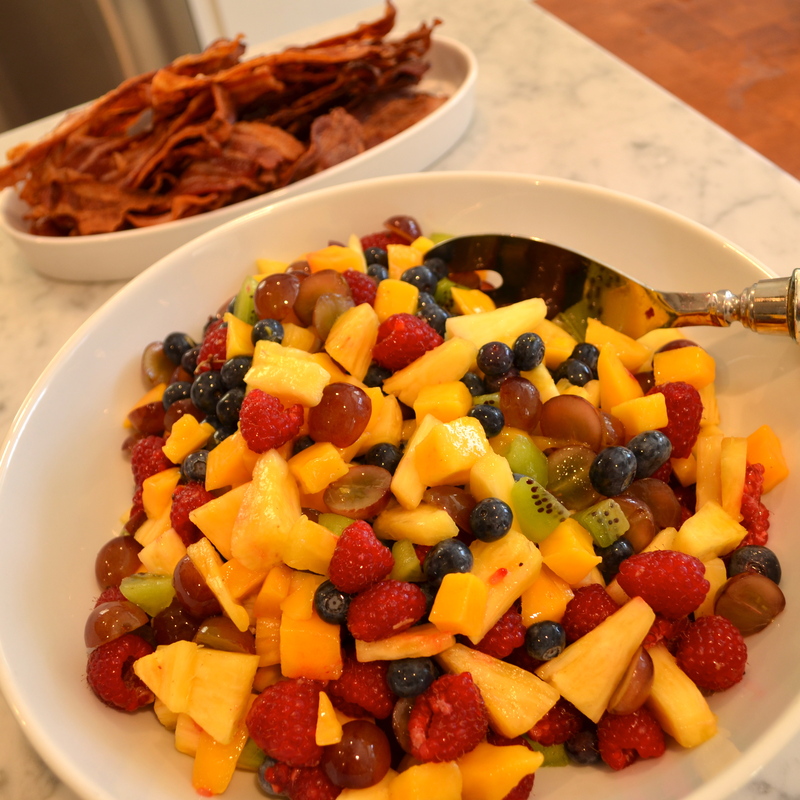 I promised to share with you my recipes from that day. So, lets begin with a step-by-step tutorial on how to prepare an easy make-ahead brunch with this Crustless Quiche Recipe. I make it in two versions, a Mexican version and an Italian version. Let me start by showing you how to prepare the Mexican version. 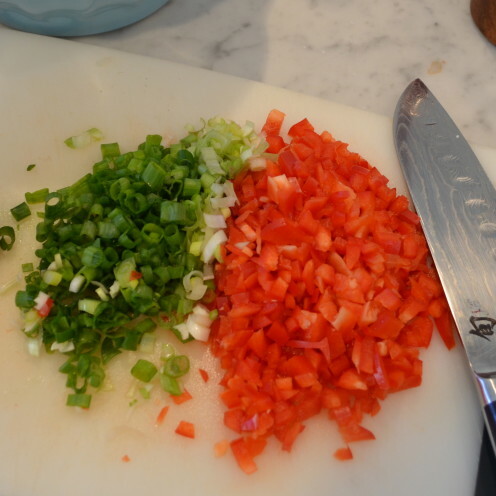 The first thing you need to do is to dice up 1 red bell pepper and 4 green onions, including both the green and the white parts of the scallons. Next, beat 1 dozen large eggs in a large mixing bowl. Measure 1/4 Cup all purpose flour and add to it 1/4 teaspoon baking powder, 1 teaspoon salt and 1/2 teaspoon ground pepper. Add the red bell pepper, green onions, flour & baking soda, salt & pepper to the beaten eggs. Using a whisk, mix it all up until the flour is well incorporated. 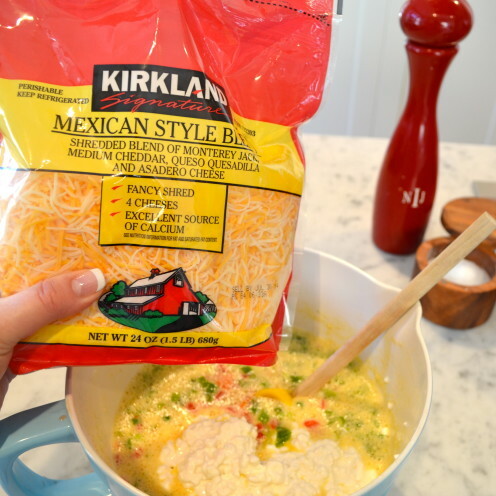 I have recently discovered this delicious Mexican Style Cheese Blend at Costco which I like to use for this recipe. It is a combination of shredded Monterey Jack, Cheddar, Quesadilla Cheese and Asadero Cheese. If you can’t find this cheese or a similar blend, I recommend using half Pepper Jack Cheese and half Cheddar Cheese instead. 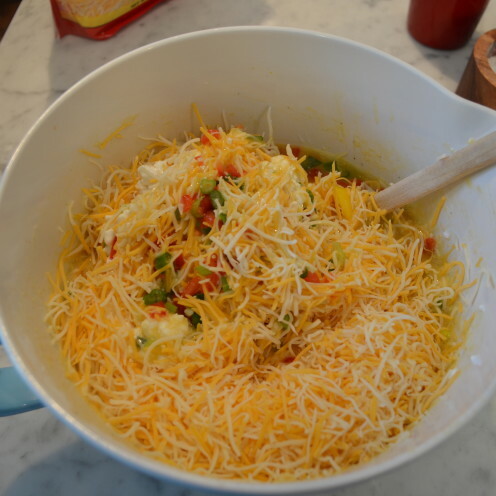 Add 1 pound of shredded/grated cheese to the egg mixture. Then add 16 oz. (1 Pint) of cottage cheese. 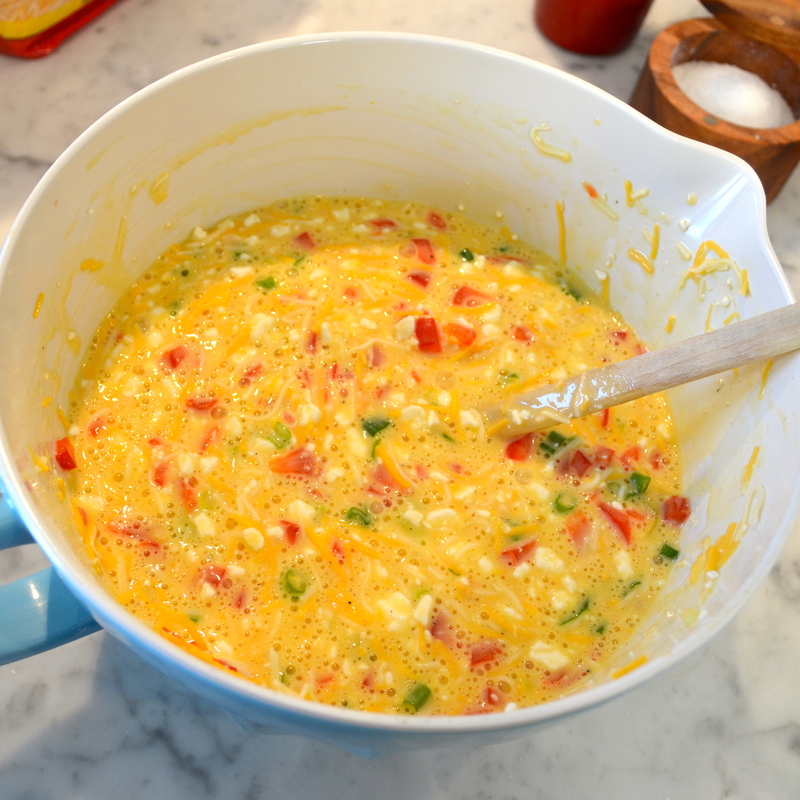 Using a spoon, incorporate the cheese into the egg mixture. Now, set it aside while you fetch a 9″ x 13″ baking pan. Spray the baking pan with cooking spray and pour in the egg mixture. 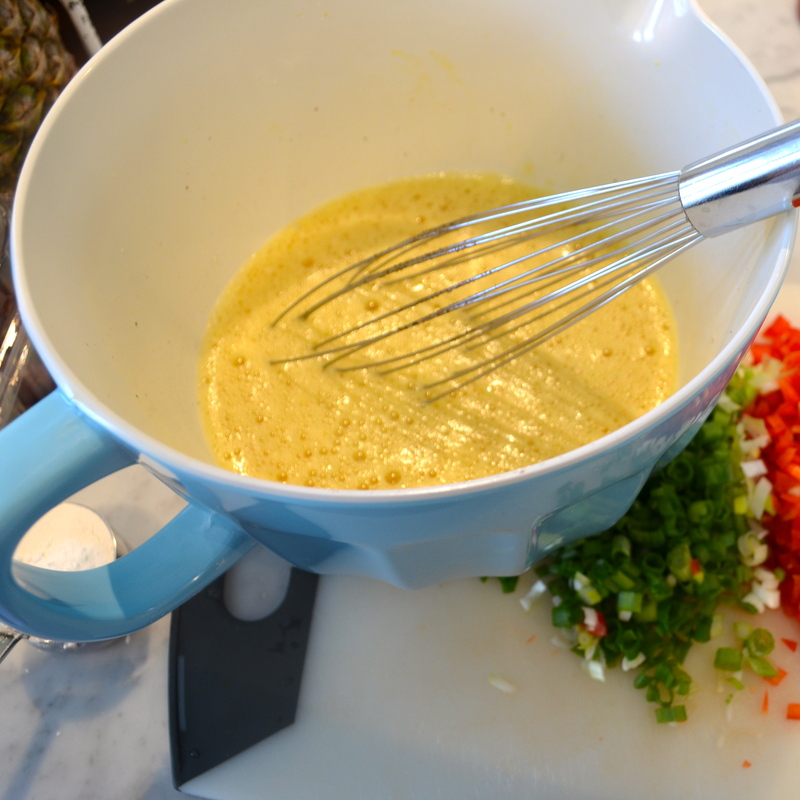 Then, sprinkle the quiche lightly with paprika. At this point, you may cover the dish with plastic wrap and store it in the fridge overnight, then bake it off the next morning. 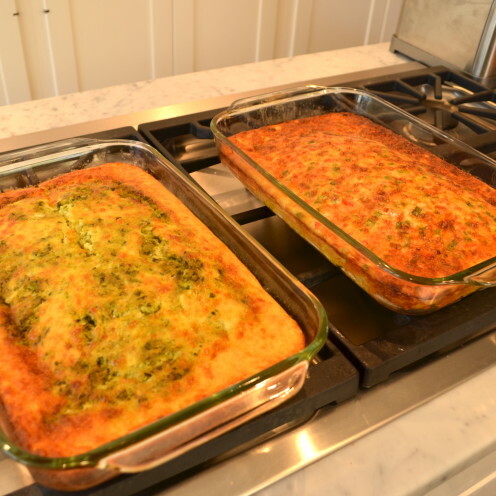 However, if you are planning to bake it immediately, you will need to preheat the oven to 350° F.
Bake the quiche for 35 to 45 minutes or until the center is set and the top is lightly golden brown. Slice into squares and serve to your delighted guests. 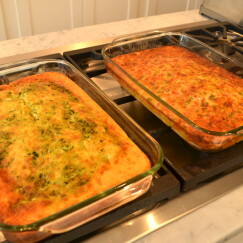 Please stay tuned and tomorrow I will give you a modified version of this recipe, the Italian Style Crustless Quiche. 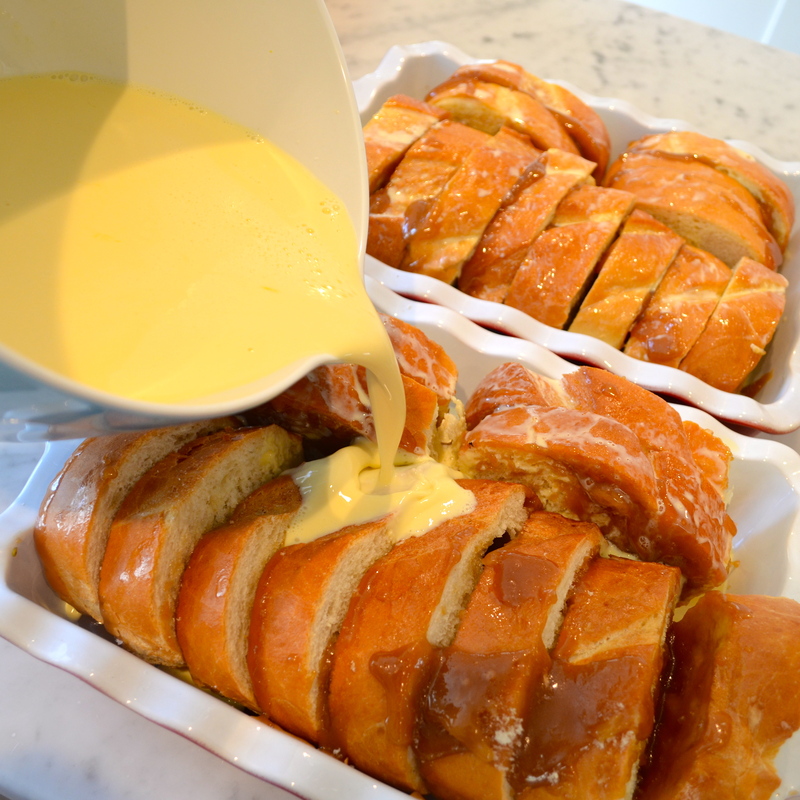 Following that, my delicious recipe for Crema Catalan French-Toast Casserole. 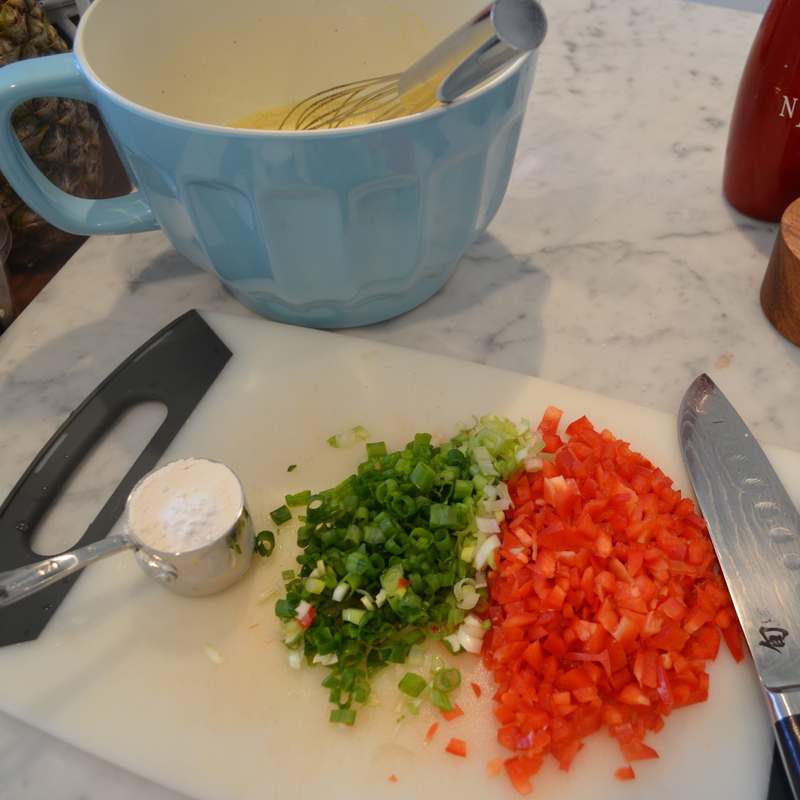 This easy to prepare, make-ahead quiche recipe is delicious. 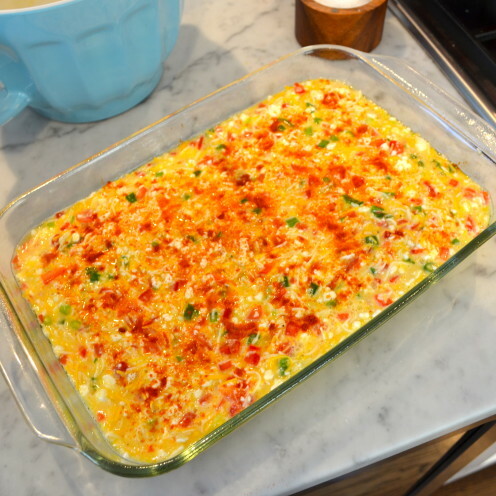 Make it the night before and pop it in the oven 45 minutes before you plan to serve a special breakfast or brunch. 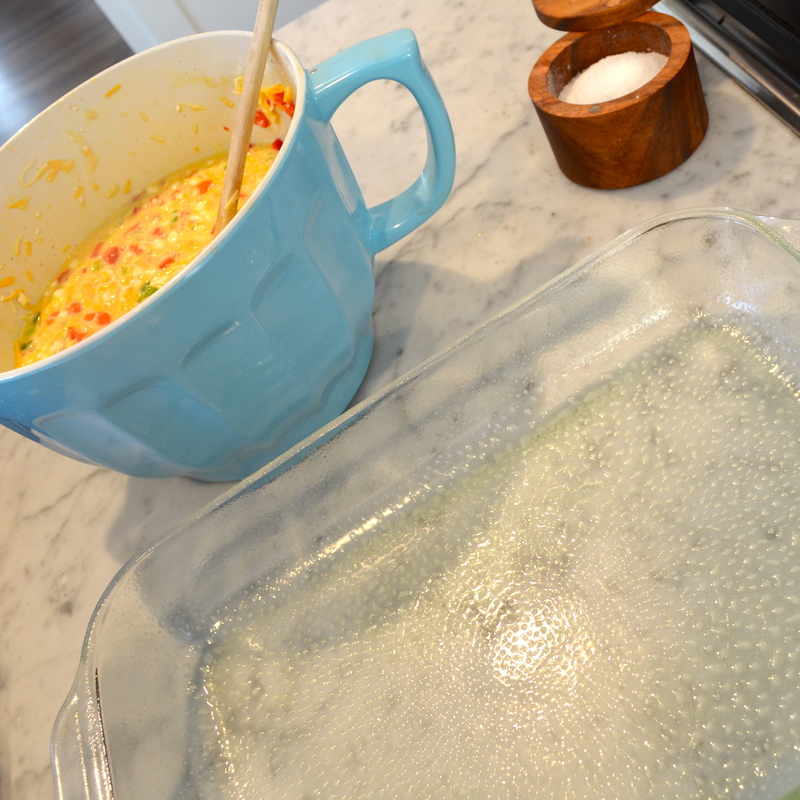 Prepare a 9" x 13" baking dish with cooking spray. 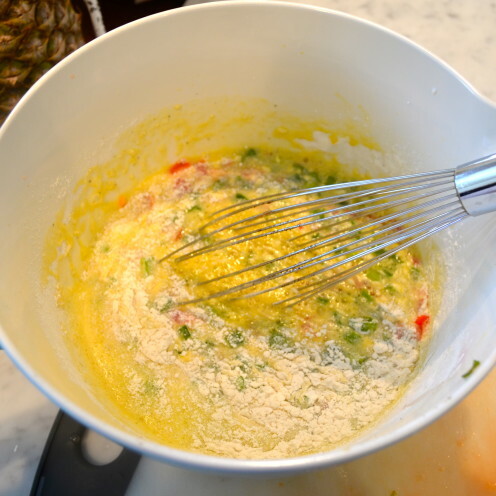 Add the flour, baking powder, salt & pepper to the beaten eggs and mix until flour is incorporated. Add in the red bell peppers and the green onions and mix to incorporate. Add in the cottage cheese and the shredded Mexican style cheese blend. 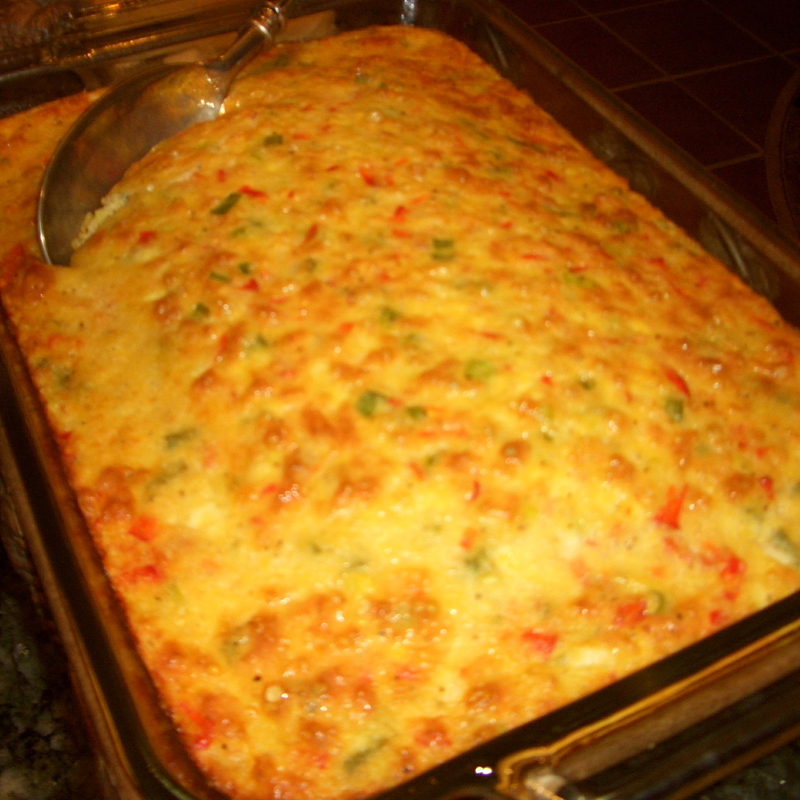 Pour into a prepared baking dish. Lightly sprinkle with ground paprika. Bake for 35 to 45 minutes until set and lightly golden brown. There is a sister recipe to this one. 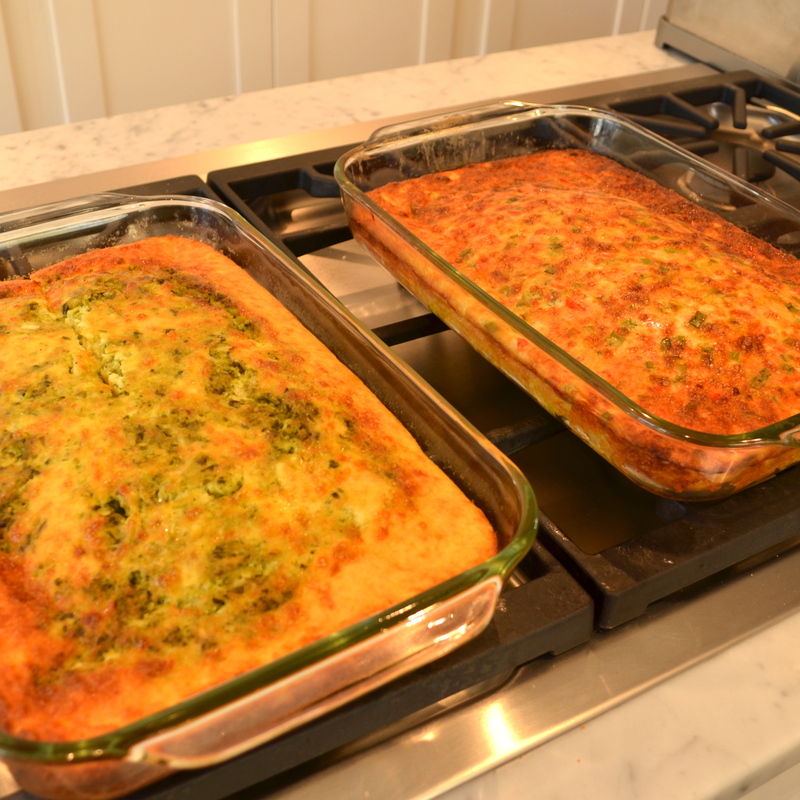 See my recipe for Italian Style Crustless Quiche.